I will be posting bday party pics this week, but I had to show you my new header! I commissioned a friend of mine to sketch an angry turtle for me and while we were visiting during Abigail's party (in a matter of 10 minutes) he handed me this sketch. Too funny! I scanned it and added some text and voila! I also updated the background via the Cutest Blog on the Block again - a new year needed a new look! 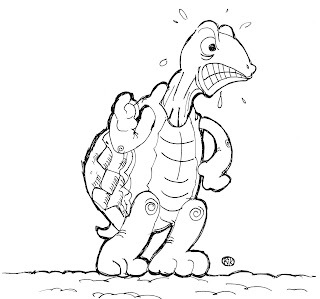 Welcome to the new and improved Angry Turtle!